Writing an intro for a finished project is always nice, but my words feel clumsy today so it’s straight to the photo. 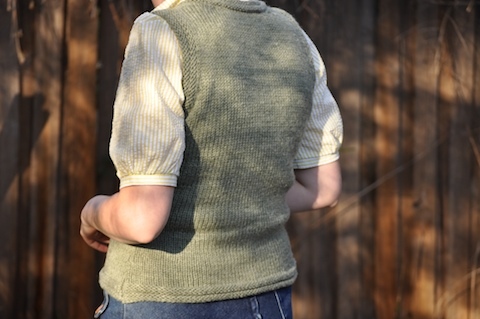 I feel funny calling it Tryst Cropped Vest, because out of those three words, only ‘vest’ is still valid. I thought elm would be a nice colour for the vest, so I was going to make Rustic 12 ply work, but hook or by crook. Luckily, I got gauge straight away. Twelve ply is a lot bulkier than what I normally work with, but it’ll be good for the cooler months. The vest was also lengthened so it ended at the hip rather than at the ribs. There is some shaping in the cropped version, so I mirrored that shaping in the rib to hip section. With the lengthening, there’s now eight buttonholes rather than four. The only thing I’m a bit funny about is the buttons. The buttons used are the best ones I’ve found so far, and happily are ones I had stashed away after a buttonmania button sale frenzy a few years ago. However, I just don’t know if they look right. 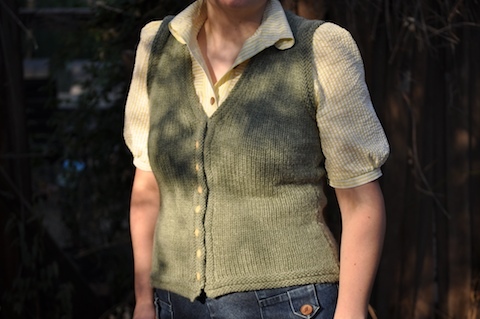 The vest is my most heavily modified knit to date, and I’m pretty happy with the results. It’s entirely wearable, and it’s given me more confidence to modify other patterns. Look out hefty stash of vintage leaflets. I like the buttons too. If you have them too matchy-matchy, you’d lose them in the lovely tweedy yarn. it’s all great. Buttons, mods everything. Yarn choice especially is good. Well done. Would you happen to have written down the mods you made for this vest? I love the length and shaping you achieved, and I am a relatively new knitter and unsure I could modify it correctly. 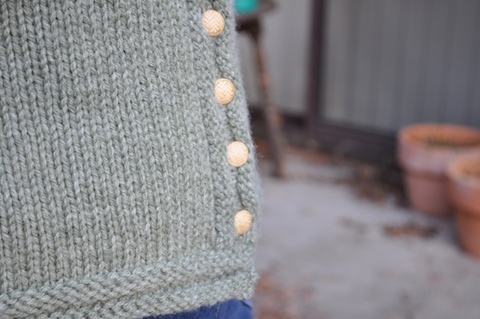 I love how this vest turned out for you! I am, like Hannah, a relatively new knitter, and don’t care for the cropped look on my body. Was the shaping tricky?